The orbital apex is the most posterior portion of the pyramidal-shaped orbit, positioned at the craniofacial junction. The anatomy of the orbital apex is significant for the complex association between bony, neural, and vascular elements. Fractures of the apex rarely are isolated because they occur in the association with or as extension of fractures of the facial skeleton, base of skull, or other more anterior orbital fractures. See the image below. Axial CT scan exhibiting a left apex fracture through the optic canal. Note associated lateral wall and medial wall fractures. This patient also required a craniotomy for a subdural hematoma. The anatomy of the orbital apex should be reviewed briefly, with emphasis on the neurovascular structures traversing the optic canal, superior orbital fissure (SOF), and inferior orbital fissure. Two bony roots that connect the lesser wing of the sphenoid with the body of the sphenoid form the optic canal. The inferior root separates the optic canal from the superior orbital fissure and also is referred to as the optic strut. The superior root forms the roof of the optic canal and separates it from the anterior cranial fossa. The body of the sphenoid forms the medial wall of the canal. From an anterior view, the entrance to the optic canal is the most superior and medial structure in the apex. Each optic canal passes posteromedially at an angle of approximately 35° to the sagittal and opens posteriorly into the chiasmatic groove (which terminates posteriorly at the tuberculum sellae). The canal has an intimate relationship to the sphenoid sinus, and with extensive sinus pneumatization, the optic canal may become completely surrounded by a posterior ethmoidal Onodi air cell, the sphenoid sinus, or an aerated anterior clinoid process. In adults, the canal is 6.5 mm in diameter and about 8-12 mm in length. The canal transmits the optic nerve and the ophthalmic artery. Throughout its intraorbital and intracanalicular course, the optic nerve is surrounded by pia mater, arachnoid, and dura mater, giving the nerve a sheath. Therefore, optic nerve is a white matter tract of the brain and carries with it meningeal coverings. Within the orbit, the optic nerve is quite mobile; however, within the canal, the optic nerve sheath remains adherent to the sphenoid periosteum and thus is fixed. The SOF is situated between the greater and lesser sphenoid wings, with the optic strut at its superomedial margin. It lies between the roof and lateral wall of the orbit. The SOF is divided at the spina recti lateralis by the annulus of Zinn, the common tendinous origin of the recti muscles. Lateral to the annulus of Zinn, the SOF transmits the lacrimal nerve, frontal nerve, trochlear nerve, the superior ophthalmic vein, and it may transmit a recurrent branch of the lacrimal artery. Within the annulus pass the superior division of III, nasociliary nerve, inferior division of III, abducent nerve, and fibers from the internal carotid sympathetic plexus. The inferior orbital fissure lies between the orbital floor and lateral wall and communicates with the pterygopalatine and infratemporal fossae. It transmits the maxillary nerve (which continues to give the infraorbital nerve), the zygomatic nerve, the infraorbital artery, venous communications between the inferior ophthalmic vein and the pterygoid plexus, and an orbital branch of the pterygopalatine ganglion. Radiographically, orbital apex fractures consist of the following 3 basic types: linear, without dislocation of fragments; comminuted, usually with fragment dislocation; and apex avulsion, with an intact optic foramen. In a series of 23 apex fractures by Unger in 1984, 20 were comminuted, 1 was linear, and 2 consisted of avulsion of the extreme apex with an intact optic foramen within the avulsed fragment. Clinically, fractures into a sinus are technically open fractures, and a risk of contamination from the sinus microbiological flora exists. The frequency of recognized orbital apex fractures has increased with the improvement of imaging techniques. Several series reviewed the incidence of fractures with trauma. Unger et al examined 490 patients admitted with nonpenetrating blunt head trauma and found orbital apex fractures in 6 patients, sphenoid bone fractures in 78 patients (of which 8 involved the lesser wing), and 30 involved the body of the sphenoid bone. Ghobrial et al reviewed 112 consecutive patients with base of skull fractures, 15% had sphenoid fractures. Mortality associated with orbital apex fractures are due to associated intracranial trauma or associated with injury to the adjacent internal carotid artery. Morbidity is common due to injury to neurovascular structures. Injury to the optic nerve leads to visual loss, being most commonly from an indirect posterior traumatic optic neuropathy. The visual loss from traumatic optic neuropathy may vary from partial to complete, and the degree of recovery may vary. Also reported is visual loss from optic nerve sheath hematoma, optic nerve transection, and optic nerve impingement from a penetrating foreign body or bony fracture. Vision loss from optic nerve compression associated with retrobulbar hemorrhage also has been reported. Injury to cranial nerves III, IV, and VI presents as extraocular muscle nerve palsy, with manifest diplopia. Injury to cranial nerve V presents as sensory disturbance to areas supplied by branches of the trigeminal (V) nerve. A review of 490 traumatic blunt head injury patients resulted in a male-to-female ratio of approximately 1.5:1, reported by Unger et al. Reymond J, Kwiatkowski J, Wysocki J. Clinical anatomy of the superior orbital fissure and the orbital apex. J Craniomaxillofac Surg. 2008 Sep. 36(6):346-53. [Medline]. Ghobrial W, Amstutz S, Mathog RH. Fractures of the sphenoid bone. Head Neck Surg. 1986 Jul-Aug. 8(6):447-55. [Medline]. Unger JM, Gentry LR, Grossman JE. Sphenoid fractures: prevalence, sites, and significance. Radiology. 1990 Apr. 175(1):175-80. [Medline]. Cole P, Kaufman Y, Hollier L. Principles of facial trauma: orbital fracture management. J Craniofac Surg. 2009 Jan. 20(1):101-4. [Medline]. Peter NM, Pearson AR. Orbital apex syndrome from blunt ocular trauma. Orbit. 2010 Feb. 29(1):42-4. [Medline]. Unger JM. Orbital apex fractures: the contribution of computed tomography. Radiology. 1984 Mar. 150(3):713-7. [Medline]. Bater MC, Ramchandani PL, Ramchandani M, Flood TR. An orbital apex fracture resulting in multiple cranial neuropathies. Br J Oral Maxillofac Surg. Mar 2008. 46:163-4. [Medline]. Sugamata A. Orbital apex syndrome associated with fractures of the inferomedial orbital wall. Clin Ophthalmol. 2013. 7:475-8. [Medline]. [Full Text]. Seiff SR, Berger MS, Guyon J, Pitts LH. Computed tomographic evaluation of the optic canal in sudden traumatic blindness. Am J Ophthalmol. 1984 Dec 15. 98(6):751-5. [Medline]. Ramsay JH. Optic nerve injury in fracture of the canal. Br J Ophthalmol. 1979 Sep. 63(9):607-10. [Medline]. Rohrich RJ, Hackney FL, Parikh RS. Superior orbital fissure syndrome" current management concepts. J Craniomaxillofac Trauma. 1995. 1:44-8. [Medline]. Zachariades N, Vairaktaris E, Papavassiliou D, et al. Orbital apex syndrome. Int J Oral Maxillofac Surg. 1987 Jun. 16(3):352-4. [Medline]. Bair RL, Wells RG, Massaro BM, et al. Imaging in orbital trauma. Semin Ophthalmol. 1994 Sep. 9(3):185-92. [Medline]. Goldberg RA, Hannani K, Toga AW. Microanatomy of the orbital apex. Computed tomography and microcryoplaning of soft and hard tissue. Ophthalmology. 1992 Sep. 99(9):1447-52. [Medline]. Manfredi SJ, Raji MR, Sprinkle PM, et al. Computerized tomographic scan findings in facial fractures associated with blindness. Plast Reconstr Surg. 1981 Oct. 68(4):479-90. [Medline]. Ettl A, Zwrtek K, Daxer A, Salomonowitz E. Anatomy of the orbital apex and cavernous sinus on high-resolution magnetic resonance images. Surv Ophthalmol. 2000 Jan-Feb. 44(4):303-23. [Medline]. Kubal WS. Imaging of orbital trauma. Radiographics. 2008 Oct. 28(6):1729-39. [Medline]. Georgouli T, Chang B, Nelson M, James T, Tanner S, Shelley D, et al. Use of high-resolution microscopy coil MRI for depicting orbital anatomy. Orbit. 2008. 27(2):107-14. [Medline]. Bilyk JR, Joseph MP. Traumatic optic neuropathy. Semin Ophthalmol. 1994 Sep. 9(3):200-11. [Medline]. Steinsapir KD, Goldberg RA. Traumatic optic neuropathy. Surv Ophthalmol. 1994 May-Jun. 38(6):487-518. [Medline]. Wu W, Jing W, Selva D, Cannon PS, Tu Y, Chen B. Endoscopic transcaruncular repair of large medial orbital wall fractures near the orbital apex. Ophthalmology. 2013 Feb. 120(2):404-9. [Medline]. Vaitheeswaran K1, Kaur P, Garg S. Minimal invasive transcaruncular optic canal decompression for traumatic optic neuropathy. Orbit. Dec 2014. 33:456-8. [Medline]. Wu W, Jing W, Selva D, Cannon PS, Tu Y, Chen B. Endoscopic transcaruncular repair of large medial orbital wall fractures near the orbital apex. Ophthalmology. Feb 2013. 120:404-9. [Medline]. Li Y1, Wu W, Xiao Z, Peng A. 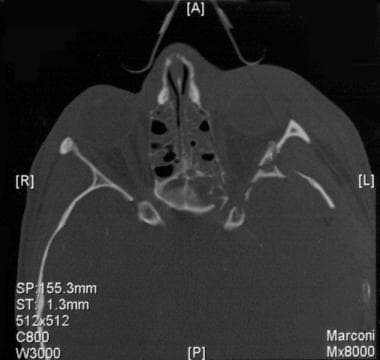 Study on the treatment of traumatic orbital apex syndrome by nasal endoscopic surgery. Eur Arch Otorhinolaryngol. Mar 2011. 268(3):341-9. [Medline]. Coronal reconstruction of CT scan of left orbital apex fracture through the optic canal. This patient presented with an orbital apex syndrome. Note the displaced bone fragment from the lateral wall of the sphenoid sinus.